Here are 10 easy homemade Bisquick recipes that you can make with Bisquick or your favorite baking mix. Keeping some baking mix on hand can make baking easier and reduce the time you have to spend in the kitchen. You can find our homemade Bisquick recipe in our Dining On A Dime Cookbook on page 50. This easy baking mix biscuits recipe makes delicious biscuits in just minutes with our homemade baking mix, Bisquick or your favorite baking mix recipe. Mix lightly until dough forms a ball. Turn onto a lightly floured surface. Knead 10-12 times. Roll dough about 1/2 inch thick. Cut with a 2-inch cutter or the rim of a glass dipped in flour. Bake at 450 degrees for 10-12 minutes on an ungreased cookie sheet. For drop biscuits, use 1 cup water and drop by tablespoonfuls onto a baking sheet. Makes one dozen. *For cheese biscuits, add 1/4 cup cheddar cheese. This easy baking mix pancakes recipe makes delicious pancakes in just minutes with our baking mix, Bisquick or your favorite baking mix recipe. Mix ingredients until moist. The batter should be lumpy. Cook on a hot greased griddle. Flip when bubbles break on the surface and the edges begin to dry. Makes 15-18 medium pancakes. This easy baking mix muffins recipe makes delicious muffins in just minutes with our homemade baking mix, Bisquick or your favorite baking mix recipe. Mix dry baking mix and sugar. Add egg, water and vegetable oil to dry ingredients. Mix only enough to moisten flour. The batter will be lumpy. Fill greased muffin tins two-thirds full. Bake at 400 degrees for 20 minutes. *For an added surprise, fill muffin cup halfway and then add a spoonful of jelly. Top with more batter. Add raisins, cinnamon or nuts for gourmet muffins. Makes 12-15 muffins. These biscuits are so yummy! If you have ever had Popeye’s you will know what I mean. These are a really close match. 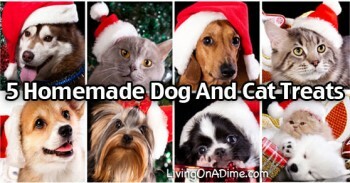 Don’t be afraid of these because they are made from scratch. 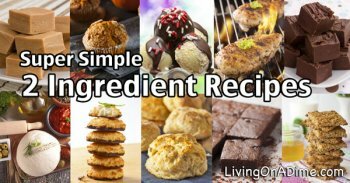 They are really very simple with only 4 ingredients. I have known many inexperienced cooks who had great success with biscuits. Try them. I think you’ll like them! Melt butter in 9×13 pan. Combine rest of the ingredients. Place dough on lightly floured surface and knead lightly. Pat or roll out to 1/2 inch thickness. Cut with biscuit cutter or glass. Place in the pan and turn over once making sure they are well coated in butter. Bake at 400 degrees until brown. If you want you can drizzle a little extra butter on top if you think it needs more. This easy Bisquick chicken and dumplings recipe is an easy way to make chicken and dumplings like mom and grandma used to make! It’s a perfect comfort food! This chicken and dumplings soup recipe can be found in our Dining On A Dime Cookbook on page 197! Make your life easier, especially your meals. My kids loved this recipe below and I always felt guilty because it was so quick and easy to make. Pour soup and water into a Dutch oven (large pan) and bring to a boil. While you are waiting for that to boil, mix the baking mix and milk for the dumplings in a bowl. When soup is boiling, drop dumpling mix by large tablespoonfuls on top of soup, which makes the dumplings. Cook uncovered 10 minutes. Cover and cook another 10 minutes. DO NOT PEEK or you dumplings will be soggy. The dumplings will look like fluffy biscuits. You can add a bay leaf, some left over cooked carrots, peas or extra chicken to the soup if you have it. Make a dough out of baking mix and milk. Roll out into a rectangle. Cut out large squares and fill with meat filling. Bake at 350 degrees for 30 minutes. *ham and cheese, broccoli and cheese, taco meat or just cheese can be used as fillings. Combine first 5 ingredients. Spread on a greased 14 inch pizza pan. Sprinkle with granola and nuts. Bake at 425 degrees for 12-15 minutes until golden. Cut into wedges and serve with more syrup. The quick and easy cinnamon rolls will be a favorite Bisquick Recipe the entire family will love! In a bowl, Combine Baking mix, buttermilk and sugar in a bowl using a fork. Mix just until all combined to create a dough. In another bowl, combine brown sugar, granulated sugar, cinnamon and nuts in separate bowl. Set aside. Generously flour rolling surface, use a good amount the dough is sticky. Turn dough out onto surface and start patting into a rectangular shape with your hand. Flour your hand well also. Use a rolling pin to thin dough to about 1/2 inch thickness. Do not over-roll, the dough will stick. Once rolled out, pour 3/4 cup melted butter over entire surface then spread with pastry brush to even out and get to the edges. Sprinkle sugar/nut mixture over butter. Start rolling dough from long end. Slice into 1 inch to 1/2 inch slices. I used dental floss to slice mine. It really does work, without mushing the pastry. Transfer slices to a well greased 9 x 13 pan. Bake in preheated 375 degree oven for 25-30 minutes, util just golden brown on tops. Let sit for 5 minutes before serving. Combine powdered sugar, milk and vanilla until desired consistency and drizzle over topped of rolls. 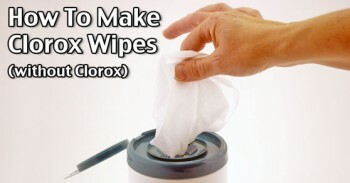 Next Post: Cheap Paper Towels – How To Save Money On Cleaning!